Looks like Oliver has decided to put HLT 709C up for auction at Carfest South on 29th August. That phone call was couple of months ago!!!!!!!!!! Do we know what it sold for? £12,500 on the hammer (not sure what their) commission rate is, so someone got an absolute bargain. I expected it to do a lot more than that, and am gutted I wasn't in a position to bid. There isn't a car in the world I want more than that one. 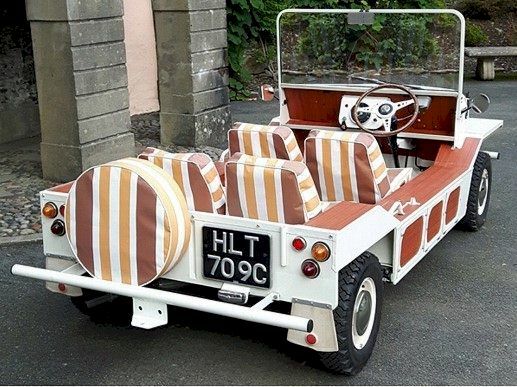 I'll be interested to see who bought it - a Mini /Moke fan, or a Prisoer fan, and how much work it needs. Does anyone know where the Prisoner Moke ended up? No idea, it's not surfaced anywhere that i've seen. I suppose some avid fan will have it stashed away. Not sure what you would do with it as would be a shame to lose the original features. It seems the car has reappeared at Portmeirion at the 50th anniversary celebration of the first broadcast of the progamme this weekend. Fingers crossed the lucky owner shares details car and of the restoration. "Six of One is delighted to announce that the fully restored “Prisoner” Mini Moke, HLT 709C, will be at the next convention, after being purchased in auction and fully restored by two of our longstanding members. 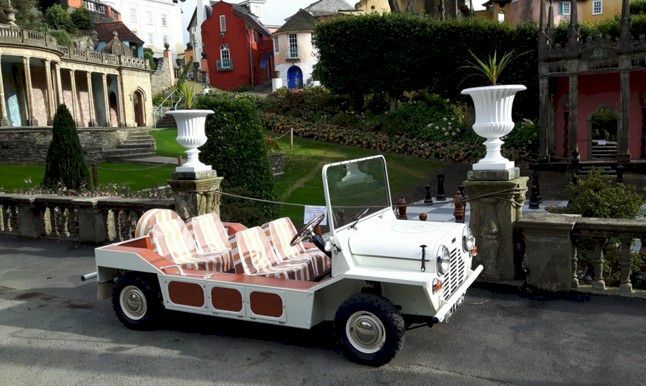 The Mini Moke restored by Six of One members Phil Caunt & Jeremy Guy in Portmeirion 29 September. The vehicle can be seen in the photo below, taken from the “Prisoner” episode “Living in Harmony”. There is an article on this in 7 October Daily Telegraph. Doubtless someone more au fait with computers than me will be able to post!! I was hoping to post a picture of the two page spread in the Torygraph, but I now find this forum doesn't host pictures, but only links to other websites like Photobucket / Flickr etc. These were the scenarios witnessed by countless startled television viewers when "Arrival", the first episode of The Prisoner, was transmitted on September 29, 1967. Fifty years later, that same Moke taxi has returned to Portmeirion to commemorate one of the few television series that can be fairly described as "iconic". Taking part in the celebrations were several of the programme's stars and one of the highlights of the day was a school party, all seemingly engaged on a GCSE art project, reacting to Fenella Fielding's tannoy announcement that "Number Six has escaped". Their response described an arc from bemusement to mild terror - which was entirely in keeping with the spirit of Patrick McGoohan's masterpiece. Several vehicles will forever be associated with The Prisoner, from the Princess 4-litre hearse of the opening credits to the Scammell Highwayman lorry of the final episode, but two cars have televisual legends. The first is Number Six's personal transport - the Lotus Super Seven Series II that the character built "with my bare hands". McGoohan spurned the chance to drive an Elan on screen and most editions show him from behind the wheel of a factory demonstrator Seven. This car was subsequently sold to an Australian enthusiast and so a second Lotus was sourced from a private owner who lived near to the MGM-British studios at Borehamwood, while "Fall Out" featured a third Seven powered by a Ford 100E engine rather than a Cosworth-tuned 1.5-litre unit. One detail that truly dates KAR 120C is that it lacks direction indicators, but then our hero is not the sort of chap who believes in any form of decadent luxury. And then there is the Moke, or rather four of them. Anyone watching The Prisoner gains the impression that Number Two had an endless fleet to assist his/her cunning plans, but this was due to the magic of editing. Just as the series combined location work with scenes shot in the studio, an overdubbed siren could turn a taxi into a police car or an ambulance. The car that is now co-owned by Phil Caunt and Jeremy Guy was converted by Wood & Pickett in May of 1965, the year that the Moke's image underwent a sea change. The vehicle that British Motor Corporation originally intended as light utility transport for the military or for use by manly chaps to tour oil explorations or building sites was increasingly perceived as a "fun car". John Boorman used a customised Moke in the Dave Clark Five pop film Catch Us If You Can and by the mid-Sixties one of the cheapest four-wheel cars in Britain was increasingly favoured by dedicated followers of fashion. When HLT 709C was converted, the plan was apparently for it to be offered as a regular option, retailing at just £664 9s 2d. The Moke featured in the coachbuilder's publicity, being photographed at the Hilton Hotel and other fine venues. One theory as to how it came to be cast in The Prisoner is that a member of the production company saw it in the capital and realised that it was ideal for their latest project. Three other cars were subsequently built although, in Phil's words, "they are similar but not identical", with a detachable canopy, brightly striped PVC upholstery, mock-wood decorations plus a more upright windshield to reduce camera reflections. The fiendish authorities were evidently too parsimonious to specify the optional seat belts, second windscreen wiper, heater or windscreen washers, but the Caunt-Guy Moke does boast one very useful modification. Unlike its three sister models, there is a 998cc Cooper engine under the bonnet, which is more than sufficient to cope with an escapee from the Village. Filming ended in 1967 and, although many memories of The Prisoner are lost to time, it is believed that HLT 709C appeared at the programme's press conference. Today, just two of the Village's fleet survives - one that was restored by Phil in the Nineties now lives in the USA, plus the only British-based model. The latter was acquired at auction by Messrs Guy and Caunt in 2015 and according to Phil, "Nobody knows what had happened to it until it was found in a barn in Holland in 2011." It is possible that a former member of the crew had privately exported it during the mid-Seventies and, 20 years later, ''the condition can best be described as 'poor'; it was structurally unsound and a non-runner. At least it did retain its number plate, the Village motif on the bonnet and the candy-striped roof." And so, Phil embarked on a mammoth restoration, possibly with the threat of an irate Rover and/or an even more irate Leo McKern serving as an extra incentive. 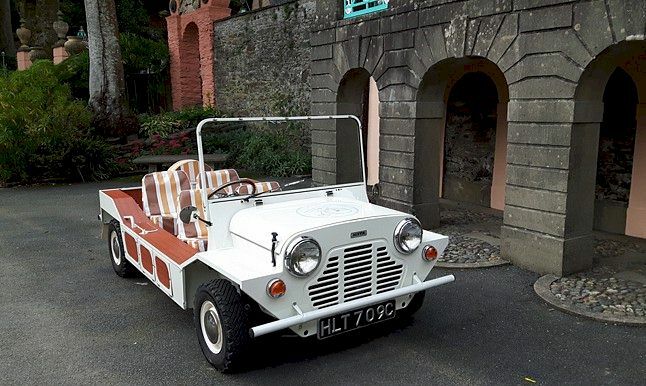 He refers to the Moke's performance as "nippy" and when being transported through Portmeirion in a completely open car that is devoid of doors, one does indeed feel the sensation of speed. Most importantly, to experience a car that has entered the lexicon of popular culture is beyond price. 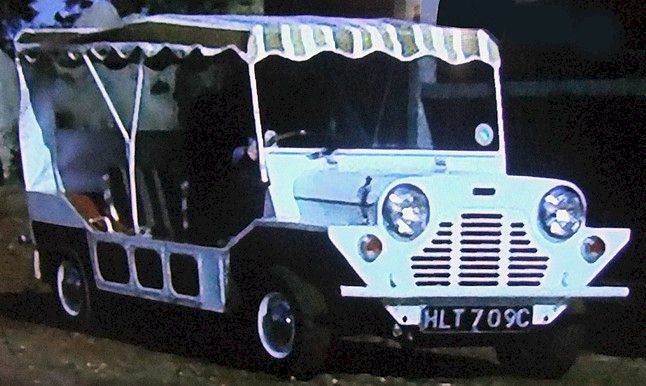 KAR 120C was said to have been written off in an accident circa 1969, but rumour has it that the hearse now lives in France while the Mini Moke taxi looks primed and ready to reinforce the message of the Village - jollity with an iron fist.